We celebrated my Partners birthday last weekend and to finish off a wonderful dinner I made dessert. 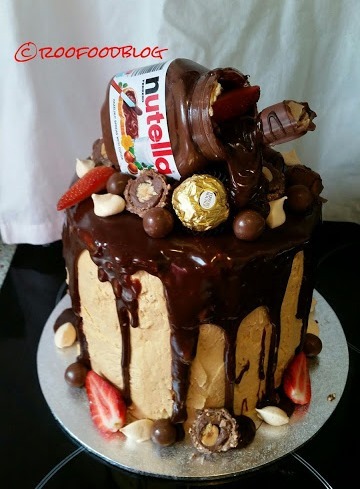 Who wouldn't want to celebrate with this birthday cake!! (or you can use whatever chocolate and fruit you want on top!) Go Crazy!!!! In a small saucepan add sugar and water and swirl water around to make sugar ‘wet’. Bring to boil and leave until sugar has melted and develops a rich amber colour. (use a wet pastry brush to wipe around the edge of the pan so that all sugar is dissolved). Remove from stove and slowly pour in ½ cup of double cream. Add ¼ teaspoon of salt and mix through. Place the egg whites and 1 ¼ cups castor sugar in a mixing bowl over a pot of simmering water. Whisk the egg white and sugar mixture until sugar is dissolved and mixture is warm. (you can rub the mixture between your fingers and feel it). Remove from heat and continue whisking on medium/ high until stiff peak stage, the bowl should also be cooled by this point. Continue to whisk and add butter one to two cubes at a time, make sure each cube is incorporated each time. The buttercream mixture will take some time to come together and will start to separate at, but continue whipping. It will come together and will be a fluffy, smooth texture (trust me). Spoon 2 tablespoons of the meringue mixture into a piping bag (or Ziploc bag) –Optional if piping baby meringues for decorations. Stir in vanilla extract into the remaining mixture. Add cooled salted caramel sauce. Whip until mixed through. Set aside at room temperature to use (can be kept in fridge for 3-4 days). Place jar of nutella into mixing bowl. Gently heat double cream in a saucepan (do not boil). Slowly pour hot double cream over the nutella and whisk together until shiny and smooth. Set aside until room temperature. Pipe small drops of meringue onto baking tray. Bake for approx 20 minutes or until just crisp. Turn off oven and open door to cool meringues. Place one cake layer on a cake plate or cake board and spread about ½ cup of buttercream evenly over the layer. Add the second mudcake and repeat with buttercream finishing with the third cake layer on top. Spread buttercream over the top and sides of the cake until covered. Ensure layer is even and smooth as much as possible. Place in fridge for 30 minutes for buttercream to set. 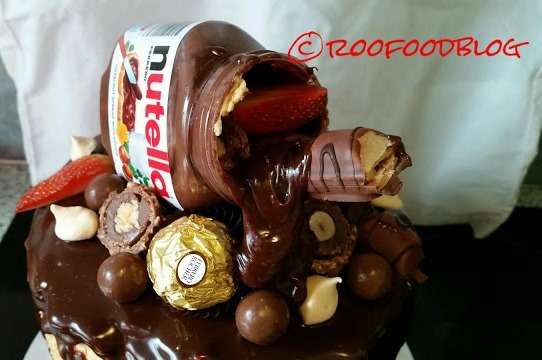 Drizzle some ganache into the nutella jar to cover the sides. Slowly drizzle the nutella ganache over the top of the cake and let it drip down the sides. Let ganache set for approx. 15-30 minutes (placing in fridge if need be) before decorating. Place Tim tams on top of cake. Place Nutella jar nestled between the two Tim Tams (secure with some ganache). Let set. 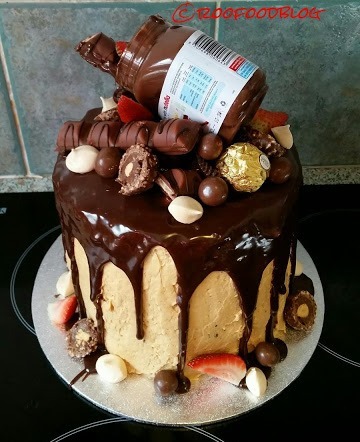 Place Maltesers, Ferrero Rochers, Bueno Kinder fingers, strawberries and meringues on top and around the bottom layer of cake, drizzle some ganache over the opening of the jar so it looks like it is oozing out of the jar. Drizzle / dot some of the salted caramel sauce on top of cake. Place in airtight container in fridge until ready to serve. Bring to room temperature to serve. Do I start taking orders?